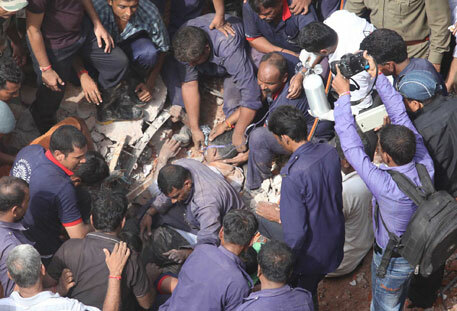 Two buildings in Vadodara, meant for the economically weaker sections (EWS) of society, collapsed during the wee hours of Wednesday morning, killing seven persons and injuring 40. According to the local fire department officials, the two three-storey buildings collapsed, one after another, in 20 minutes. 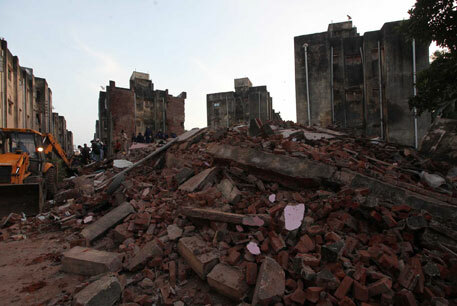 The residents had been complaining to the authorities about the weak structure for over two years. According to the local fire department official, H J Tapariya, 14 families residing in the buildings in Madhav Nagar locality of Atladara area were caught unawares when the buildings collapsed, one after another, leaving six persons dead. The injured were rushed to Sir Sayajirao General Hospital; three of them are critical. Meanwhile, 30 others who were trapped inside the buildings were rescued by 10.30 am. Soon after the mishap, Gujarat Chief Minister Narendra Modi announced a compensation of Rs 2 lakh to the kin of people of died in the mishap. since The families had been complaining about the weak structure since 2010. On February 15, 2010, around 300 residents barged inside the office of the Vadodara Urban Development Authority with broken cement slabs, accusing the authority of neglecting repair of the buildings. Now, the Gujarat government has launched an inquiry. The locality has as many as 266 flats with over 5,000 people residing in them. Residents have been complaining about lack of basic facilities and poor construction material. They said that most of these houses have developed cracks. During monsoon, water leaks from the terrace, forcing many residents to shift their valuables to apartments in the lower levels.